As the election race heats up, the economy is Jokowi’s likely vulnerability; meanwhile Prabowo boosts campaign coffers. 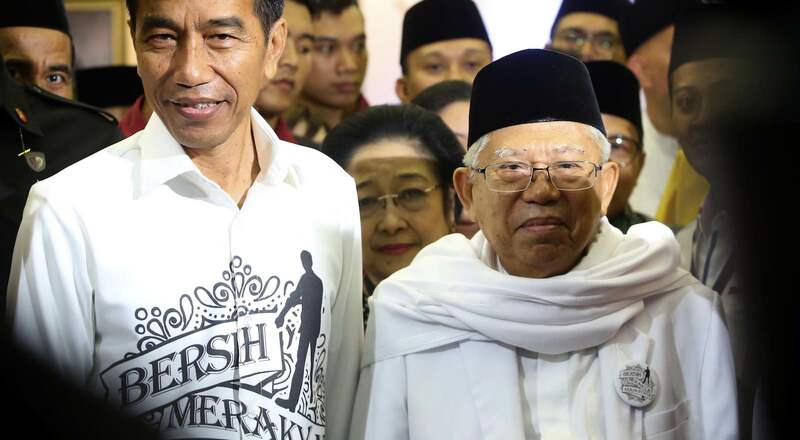 The confirmation by President Joko (Jokowi) Widodo’s of conservative Islamic cleric Ma’ruf Amin as running mate for the April 2019 presidential contest evoked disappointment among constituencies in Indonesia committed to democracy and pluralism. Interpreted as a forced compromise, a Jokowi-Ma’ruf ticket certainly acts as a buffer against conservative Islamic opposition, but it by no means guarantees Jokowi an election victory. Economic issues above religious ones are likely to be a key point of vulnerability for Jokowi in the presidential campaign. Ma’ruf’s record of sowing division and intolerance in his capacity as Chair of the Council of Indonesian Ulema (MUI) has caused concern among non-Muslim segments of Indonesia’s population and more liberal political circles, concerned about their country’s increasingly divisive politics. Critics of Jokowi’s decision have pointed to Ma’ruf’s propensity to legitimise violence and discrimination against minorities and political opponents as leader of MUI, an increasingly obscurantist, national body of Islamic scholars. Ma’ruf stems from Indonesia’s largest mass Muslim organisation, Nahdhlatul Ulama, whose former leader and Indonesia’s fourth president, Abdurrahman Wahid (Gus Dur), was a respected a champion of pluralism and democratic ideals. Ma’ruf, however, strays far from Gus Dur’s enlightened traditions. Under Ma’ruf’s leadership MUI has issued fatwas against Muslim minority sects Ahmadiyah and Shia, which have served to sanction violence and discrimination against them. Similarly, an October 2016 MUI fatwa declaring that incumbent ethnic Chinese Jakarta governor, Basuki Tjahjaja (Ahok) Purnama had insulted the Quran, was a legitimating factor in the mobilisation of sectarian and racially-charged Islamic opposition against him. In a pragmatic sense Ma’ruf’s confirmation undoubtedly adds to Jokowi’s legitimacy in the eyes of conservative Muslim constituents. Ma’ruf’s previous actions have been rightly interpreted as the triumph of conservative Islamic values over Indonesia’s pluralist and democratic norms. But in a pragmatic sense Ma’ruf’s confirmation undoubtedly adds to Jokowi’s legitimacy in the eyes of conservative Muslim constituents. It also affords Jokowi somewhat of a bulwark against Islamic-based opposition used to such devastating effect against Ahok, Jakarta’s former governor. Many will recall in both the 2014 presidential election and to a lesser extent, in the Jakarta gubernatorial election, how doubt was sown about Jokowi’s ethnicity and religion by opportunistic and radical opponents. 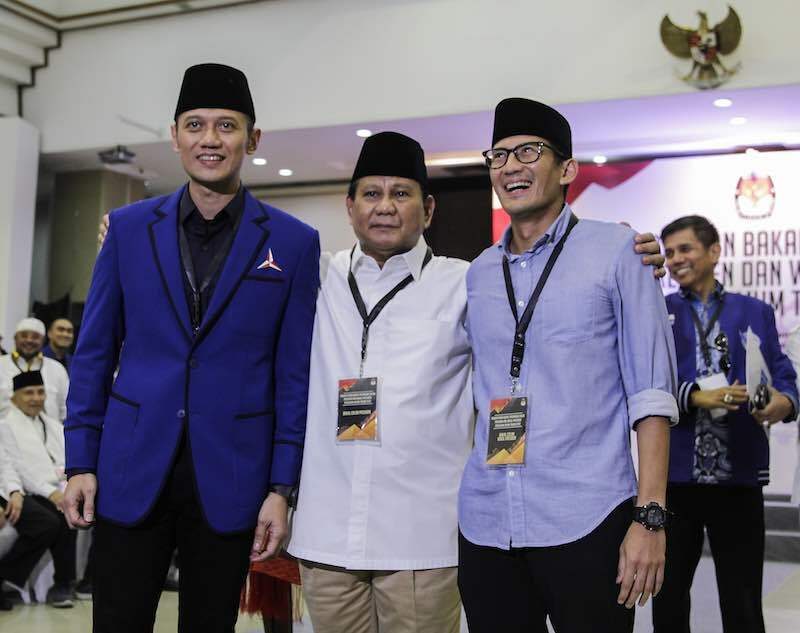 Meanwhile, confirmation from the challenger Prabowo Subianto that incumbent deputy Jakarta governor, Sandiaga Uno, would run as his vice presidential candidate also caused consternation, not least for Partai Demokrat (PD) chair, former president Susilo Bambang Yudhoyono (SBY). SBY was understood to have clinched a deal for his son, 40 year old former Army Major, Agus Harimurti Yudhoyono (AHY) to run with Prabowo in return for PD joining Prabowo’s Greater Indonesia Movement (Gerindra)-led opposition coalition. Shock within PD ranks was followed by allegations that Uno, one of Indonesia’s wealthiest men, had used his considerable largesse to secure the vice presidential ticket. Uno had allegedly paid considerable sums to the Justice and Prosperity Party (PKS) to remain in, and to the National Mandate Party (PAN) to switch, to, the opposition coalition. PAN, the political vehicle of Indonesia’s second largest Islamic mass organisation, Muhammadiyah, had until 10 August been part of Jokowi’s governing coalition. Uno’s joint Sumatran and Sulawesi ancestry means he appeals to a voter base beyond Java, but undoubtedly Uno’s main political utility for Prabowo is his wealth. Uno is understood to be one of the key financiers behind Gerindra’s-coordinated opposition to Ahok during the 2016-2017 Jakarta gubernatorial contest.In the months leading up to the vice presidential announcement there was speculation that Prabowo would not run again due to denuded campaign resources. The 2019 election will be Prabowo’s fourth attempt at the presidency and in securing Uno, Prabowo significantly boosts his campaign coffers. The wily political veteran has also managed to retain PD in his coalition despite SBY’s deep disappointment with the decision. No doubt, AHY has been promised political rewards in a key cabinet post, following in his father’s footsteps. With 10.19% of the national vote in the 2014 legislative elections, PD’s entry into the opposition coalition along with PAN at 7.59%, strengthens Prabowo’s chances. Unless Indonesia’s economy significantly improves, Jokowi’s incumbency gives the rival Prabowo-Uno ticket the natural advantage on economic issues. Indonesia’s economic prospects over the next eight months to the April 2019 first run-off are far from certain, particularly given recent developments in emerging markets. Turkey’s currency slide has buffeted the Rupiah and the uncertainty of Trump’s “trade wars” still have a way to play out on global economies, including Indonesia’s. Jokowi’s ambitious infrastructure agenda, moreover, lends him vulnerable to Prabowo’s strident economic nationalism and anti-Chinese inclinations. Prabowo understands that many Indonesians are uneasy about perceived Chinese dominance over the economy, expressed in negative sentiment toward Indonesia’s ethnic Chinese and in Beijing’s generous investment in Indonesia’s infrastructure projects. Moreover, resentment toward Chinese workers in particular, is becoming more apparent, fanned by perceptions of a “flood” of illegal Chinese labour and online fearmongering. If Indonesia's economy slides, it will boost Prabowo’s chances with an electorate suspicious about foreign control and erosion of economic sovereignty. Disappointing for some, the vice presidential picks are insightful in what they reveal about Indonesia’s contemporary politics. Indonesia’s secular-based parties must now edge to the religious right in order to become more electable; a significant shift over the last 20 years, where it was previously the conservative Islamic parties forced to the centre. The presidential-vice presidential tickets also illustrate how the distribution of largesse determines elite coalition formation and senior political appointment. Another disappointment for those who hoped that democratisation would diminish rent-seeking behaviour and instil greater integrity within Indonesia’s political and institutions. But in the end, Jokowi’s fate may be contingent upon external factors largely outside the cauldron of Indonesia’s domestic politics. For despite growing Islamic conservatism, Indonesia’s voters, like many others around the world, are usually impelled by economic considerations above religious ones. Notwithstanding unanticipated shocks and disjuncture, the economy will continue to be Jokowi’s key point of political vulnerability despite high personal approval ratings. Expect another dirty campaign based on a populist narrative of economic nationalism and anti-Chinese sentiment. If Myanmar dares to defy the pro-dam lobby, the dream of peace, friendship and cross-border cooperation could become a reality.